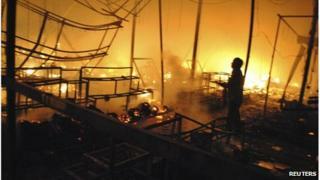 Eight people have died in a fire at a night market in the Cambodian tourist town of Siem Reap. Police say four children were among the dead. They had been sleeping with their families on the upper floor of a building in the market and were unable to find a way out of the flames. More than 100 stalls were destroyed in the blaze, which police said was caused by an electrical fault. The market was not trading at the time of the fire. Siem Reap is close to the country's main tourist site, the ancient temple complex of Angkor. The night market sells souvenirs and is popular with tourists.